Seidio is now shipping their Innocase® for the Droid 2. Since before buying my Droid 2 I have been researching alternatives for smart phone cases. The Seidio Innocase is one of the consistently best reviewed cases for all smart phones. Comments on the Innocase are unformily positive. 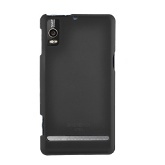 Unfortunely, until about a week ago Innocase was not available for the Droid 2. Be aware that there are enough differences between the Droid and Droid 2 that the cases are NOT interchangeable. So a few days ago I bought my Innocase via the Seidio online store. Process was easy and shipped the same day via FedEx. I purchased the combo of the case and holster. However, Henry Ford must have been the design consultant for the D2 case. Unlike cases for the iPhone, you can have any color as long as it’s black. My wife reports that this is so BORING! The case is made of a polycarbonate that is coated with a thin non-slip rubber-like material to improve gripping the phone. The case is only about 1/16 inch thick. The Innocase comes in 2 pieces that attach to the lower (sliding) and upper (display) portions of the phone with very small tabs that grip the edges. Though very small, these tabs secure the case well. Installation is a snap. I can report that the Innocase does not interfere with sliding mechanism in any way. Cutouts are provided for all phone items such as power connector, headphone jack, microphone, speaker, volume control, camera, power switch etc. The case does remove easily for access to the battery/ microSd. Regarding operation of the slide out keyboard; I have found no difficulties. The D2 (without case) has less than 1/8 inch space above the top row of keys. The Innocase uses a minimum amount of this space. I found that even with my fat thumbs I had no difficulty (i.e. no missed or erroneous key presses) using the upper row of keys. In fact I found if I slipped my thumb up against the edge of the case I was positioned right over the top row keys. 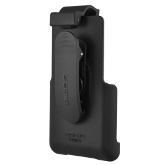 Seidio has 2 holsters available; non-cased devices and Innocase devices. I have the Innocase holster. The holster is well built and provides a secure belt attachment. The belt clip swivels allowing vertical, 45-degree or horizontal carrying of the phone. To secure the phone you slip it in on the bottom and snap the clip on the top. The top clip is offset so it does not interfere with headset & power switch if you clip in with the screen facing in. The inward facing screen is recommended to reduce screen scratch risks. The holster is felt lined to protect the screen. In summary I am very happy with the Innocase and belt holster. They are well designed and constructed. I recommend them for anyone with a Droid 2. Posted: October 29th, 2010 under Android.